Over 570 owners and operators have been involved with the Viscount. Some like Capital Airlines (USA) and BEA - British European Airways Corporation operated many while others like Air Anglia operated only one. Viscounts operated by large airlines who had their aircraft for many years will have painted them in several different versions of their livery. Displayed will be the fleet list for the selected owner or operator together with each aircrafts history sorted by the date that the aircraft joined the fleet. NOTE: Some aircraft may have entered the fleet several times and possibly with a different registration. Donated by Tony Abad and re-registered from N555SL. Taken at Carl A Spaatz Field, Reading, Pennsylvania, USA 9 April 2017 and now looking shabby as it is outside in all weathers. None of this would help any ambition to get her flying again. Corrosion in hidden areas would be the main concern as well of the cost of getting all the systems and engines running again. An almost impossibe situation these days without the technical backing of the original manufacturers. This aircraft c/n 233, a V.745D, was built for Capital Airlines (USA) as N7471 and first flew on Thursday, 27 June 1957 at Hurn, Bournemouth, Hampshire, England. 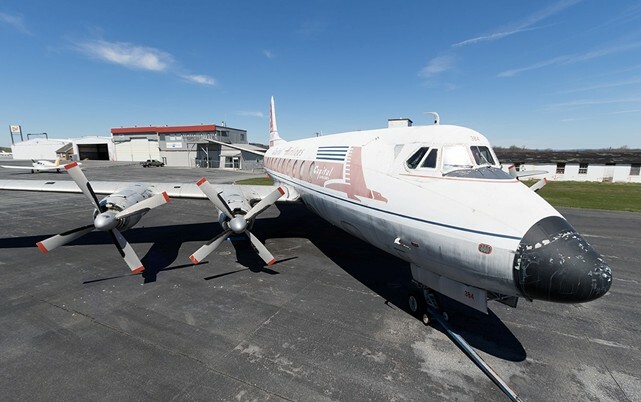 Its final owner/operator was Mid Atlantic Air Museum (MAAM) as N7471. Donated by Tony Abad (Clara Strauss Abad) to the Mid Atlantic Air Museum (MAAM) with the help of the Capital Airlines Association May 1992. Ferried to Clarkesburg Airport, West Virginia USA and repainted in a Capital Airlines livery June 1992. Re-registered N7471 and ferried to Reading, Pennsylvania, USA August 1992. Displayed at the Wilkes-Barre Airport air show, Pennsylvania, USA 22 August 1992. Flown into Ronald Reagan National Washington Airport, Arlington, Virginia, USA for the 1993 Airliners International convention and remained on static display throughout the event July 1993. Noted being restored back to flying condition at Carl A Spaatz Field after a long period on the ground due to a defective Dart engine in February 1997. Cabin interior noted being restored to passenger configuration with parts from Viscount N7439 (C/N 137) in September 2000.